Every manufacturer claims to have the best products. So, how do you choose the truly right and premium quality ones? To help clients in their decision, Scyphus, designing and manufacturing bespoke paper cups, has always operated in full transparency and accuracy. In today’s rapidly evolving market landscape, our biodegradable and compostable paper cups are valued as the best 100% UK manufactured, be it in terms of quality, design or affordability. Unlike many paper cups that are branded as being recyclable, our range of products is fully environment-friendly, helping businesses adhere to a true policy for environment protection in line with governmental regulations. 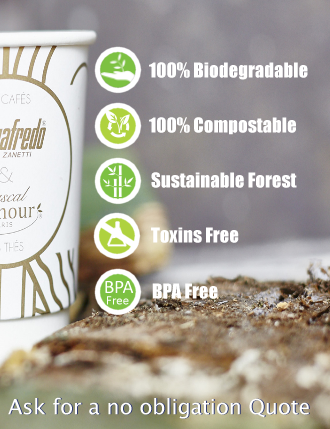 Once branded, our range of biodegradable paper cups will likewise echo the core values of your food outlet or business in shaping a greener and healthier environment. 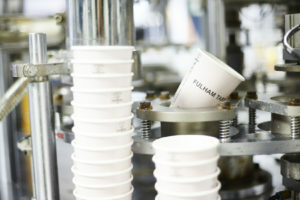 Takeaway coffee cups are one of the most sought after products in the food and beverage industry. A rapidly expanding market, the coffee industry reflected a healthy growth of 5% in 2017 with a total of 24,061 coffee shops in the United Kingdom. By 2022, the coffee industry is projected to generate a turnover of more than 18 billion pounds. In this prosperous landscape, takeaway coffee cups have grabbed a large share of the market as an increasing number of clients prefer on-the-go options. Scrupulously keeping in line with the demands of the market, Scyphus has been striving for continuous development and efficiency to ensure that our customers get the latest products and solutions at best prices. The double wall branded paper cup tops the list with the majority of coffee shops, food outlets, gourmet cafe, shopping malls and even car dealers using it the most. The double wall biodegradable and compostable paper cup comes in an array of formats to suit different types of businesses. They are manufactured as hot drinks cups, popularly known as coffee cups, cold drinks cups, coupon cups and vending cups. They are available in various sizes staring from 8 oz and ranging up to the 16 oz cup that coffee lovers appreciate the most. Our branded biodegradable double wall paper cups are designed to maintain the perfect temperature of the beverages thanks to the cushion of air created between the walls. The high quality paper also guard against burning, making sure that customers enjoy their freshly-made drinks safely without any hurry. When serving cold drinks, they are guaranteed not to turn soggy or mushy. 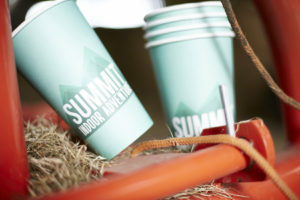 At the same time, the premium material used makes the cups perfect for any printed design. For those in the B2C market, coupon cups that are manufactured as double wall cups are the latest craze. Our state-of-the art technology allows us to design highly impressive printed paper cups with a peel-off section that can be used to feature a ticket or a coupon for instance. They are currently embraced as a powerful marketing tool for the simple reason that people are instinctively attracted to free tickets, prizes and discount coupons. 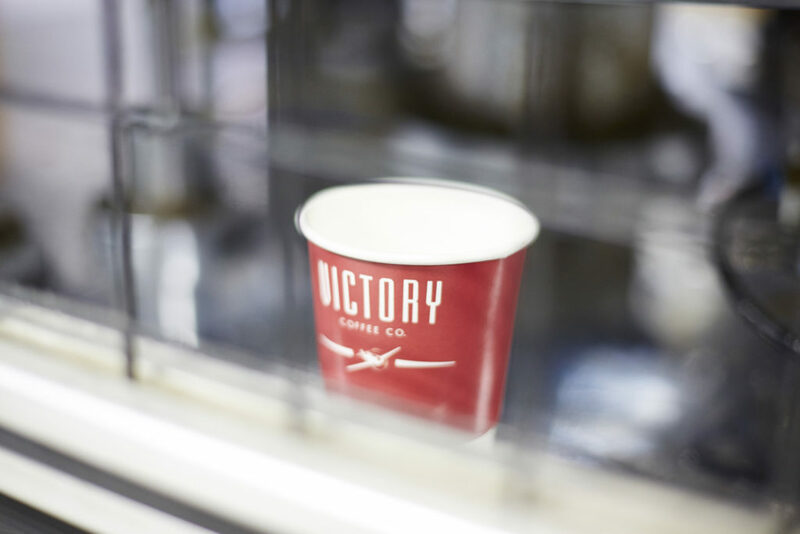 Our range of printed Vending Paper Cups are manufactured in an array of high-quality and functional cups designed to enhance customer satisfaction as well as profitability in the vending business. They are available in various sizes to fit the various types of vending machines. Just like the other cups, these ones may also be branded with any design or logo to make them visually appealing and trigger brand awareness. Our pre-printed deli paper cups also form part of our range of double wall printed paper cups. Crafted by our in-house team, they are manufactured to be highly practical and impressive at the same time. They suit businesses that do not want to spill over on excessive branding and that are seeking existing customized products. Single wall paper cups are equally available ranging from 4 oz to 16 oz. When paired with java jackets, they can be used to serve both cold and hot beverages. Our range of biodegradable and compostable products also extends to accessories such as paper napkins, bunting and CPLA sip through lids pairing with our printed cups. Our CPLA lids can resist heat up to 85 °C and are tight fitting. They are currently available only for coffee cups in 80mm and 90mm. Ice cream cups will soon be included in our biodegradable product range. Consumer demand has expanded with an increasing number of customers looking for eco-friendly products. In today’s market, many packaging products boast environmentally-friendly benefits without being truly eco-friendly. For instance, recyclable paper cups do contain a percentage of plastic or wax that serve as a coating to prevent leaking. These are popularly referred to as PE cups. These cups can be recycled only to a certain degree and in specific factories. This process is considered as difficult as it is cumbersome to separate the paper from the plastic lining. Other terms that can be confusing are “degradable” that refer to products made of traditional plastics, such as polyethylene, but which are treated with additives, usually consisting of calcium carbonate and heavy metals which causes the material to disintegrate over a number of years. Degradable products do not compost and contaminate the end material. Other companies boast the use of innovative environmental composite materials such as specific coatings. However, even they are engineered for recyclability, they comprise of a high percentage of plastic and have to be recycled in adapted recycling factories. Biodegradable and compostable paper cups are different. Instead of being manufactured with petroleum-sourced traditional plastic, they are produced with bioplastic material that is strictly sourced from plants such as corn or sugar cane. These types of paper cups are generally known as PLA paper cups. Even if bioplastic may visually resemble traditional plastic, they are completely different in the sense that plastic may take up to 1,000 years to degrade while bioplastic- made from renewable raw materials- is thereby resource and environment friendly. Bio plastic is non-toxic, biodegradable and compostable. It biodegrades in less than 60 days, decomposing back into natural elements. Further than that, biodegradable and compostable paper cups differ from each other as well. A biodegradable paper cup is not necessarily compostable. Even if both are sourced from renewable raw materials and are meant to biodegrade and return to nature, they break down at different rates. For products or materials to qualify as biodegradable, they must completely break down and decompose into natural elements within a short time after disposal - typically a year or less. Compostable materials are similar to biodegradable materials but go a step further by providing the earth with valuable nutrients once the material has completely biodegraded. These materials can be added to compost piles. Currently, only PLA is compostable, hence making our biodegradable range of products compostable as well. It is worth noting that a composter accepts zero percentage of plastic as even the least quantity present will contaminate the whole output. In addition to that, the paper that we buy to manufacture our printed paper cups is strictly from FSC or PEFC certified mills only. It is procured from sustainable forests. The material used to manufacture our biodegradable range of paper cups equally complies with the specifications established in the American Society for Testing and Materials in accordance with the “Biodegradable Products Institute-Certification Program for Products Made of Compostable Plastics-Program Rules”. Scyphus offers a full range of bespoke products for the coffee service industry, ice cream parlours, deli stores and popcorn vending services. Products range from the ubiquitous branded coffee cups or the double wall paper cups, to the cold cups or single wall branded cups, ice cream cups, cups specifically designed for vending machines and all sorts of accessories like transparent dome lids for ice cream pots, sip through lids for the branded paper cups, coffee sleeves or java jackets, paper napkins, paper coasters and bunting. All of these are available in the PE ( Polyethylene) lined paper range, the range that is 100% recyclable and 99% biodegradable ( special treatment required ). Currently our Biodegradable and Compostable range of products are offered in the range of double wall paper cups, popularly known as hot cups or coffee cups, cold cups or single wall paper cups, vending cups of special sizes, coffee sleeves or java jackets, popcorn boxes and a special range of Bioplastic CPLA Sip Through Lids for your Double Wall Coffee Cups. Double Wall Cups of all popular sizes starting from the 8 oz and ranging up to the humongous 16 oz cup that coffee aficionados swear by, we have them all in the bio range of cups. They are perfect, in terms of quality and aesthetics. print and form, and to top that the PLA cups today can withstand pretty hot beverages, and then you all know the best part is, they are 100% biodegradable and 100% compostable. Single Wall Cups too are available in all the popular size of 4 oz till 16 oz and when used with the java jackets, these have dual use of a cold cup and a hot cup in one product. "Very soon we'll add Ice Cream Cups to this range of Bio Products too, feel free to inquire if you have a requirement of a bulk order for Ice Cream Cups using the Contact Form instead of asking for a Quote, we'd respond if it's available." Our high-quality Biodegradable Hot Drink Cups provide optimal insulation, reliability, convenience and visual appeal. Branded cups are available as from 1,000 units. Our Biodegradable Double Wall Paper Cups bearing an insulated outer layer offer additional protection for serving hot beverages like coffee. 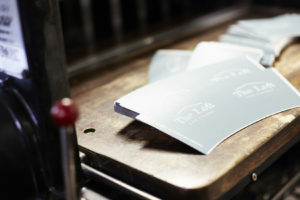 Their robust design and paper thickness maximize convenience for customers. Our Biodegradable Vending Paper Cups are available as Single or Double Wall cups in various sizes to adapt to different vending machines. They can be customized to generate brand awareness. We offer pre-printed biodegradable paper cups that can pair with your own deli store theme. They are one of our best-selling products that are known for their appeal and robustness. Our Biodegradable Single Wall Paper Cups can hold certain moderately cold drinks and those at room temperature. To guarantee user-convenience, we recommend choosing our trendy Biodegradable Double Wall Paper Cups.